From March 27 to April 6 in Scotland, as part of the Information Warrior Exercise, more than 1,000 Royal Navy personnel, including regular and reserve forces, the Navy's surface, submarine and air fleet and the Royal Marines, will test the protection of submarines and war ships against cyber attacks. Intelligence, Surveillance and Reconnaissance (ISR): Building the intelligence picture with unmanned systems to further enhance command decisions. The RN says the risk of cyber attacks against its ships and submarines is as real a threat as traditional weapons such as rockets, missiles and torpedoes. Combat and communications systems, power and propulsion control systems are run by computers, and a successful cyber attack could potentially disable a ship, rendering it ineffective. The UK Ministry of Defence’s Defence Science and Technology Laboratory (Dstl) will help ensure RN forces are secure and resilient to cyber threats, in accordance with the National Cybersecurity Strategy. Information Warrior builds on the impressive success of last year’s Unmanned Warrior exercise, which saw more than 50 unmanned systems from different manufacturers integrated into naval command and control systems. Information Warrior will focus on how information can be used offensively and defensively to give the UK’s armed forces a battle-winning advantage. Information Warrior will have an intelligence exploitation theme, which the Royal Navy says will demonstrate that multiple intelligence sources, ranging from open source intelligence and satellite imagery, to agile search applications, will enrich the intelligence picture and reduce the workload on the busy analyst. The improved quality and accuracy of the intelligence assessments will allow Command to make better informed decisions in shorter time periods. Dstl support in this area includes the Adaptive Tactical Information eXploitation (ATIX) and Every Platform A Sensor (EPAS) projects. ATIX uses all the available data sources, applying data analytics, machine learning and statistics to improve the commanders’ understanding of complex situations. Currently, much of the data gathered by sensors is not used. EPAS will address this by extracting useful information on events, such as ship tracks, from every available source. This builds a comprehensive store of data that can be analysed in real time, or at a later date. Dstl is working on smaller, more agile and user-friendly secure communications. This will enable new concepts of operations by delivering greater situational awareness. The Royal Marines will put this system to the test during the exercise to ensure that it allows their command to communicate effectively with troops on the ground. 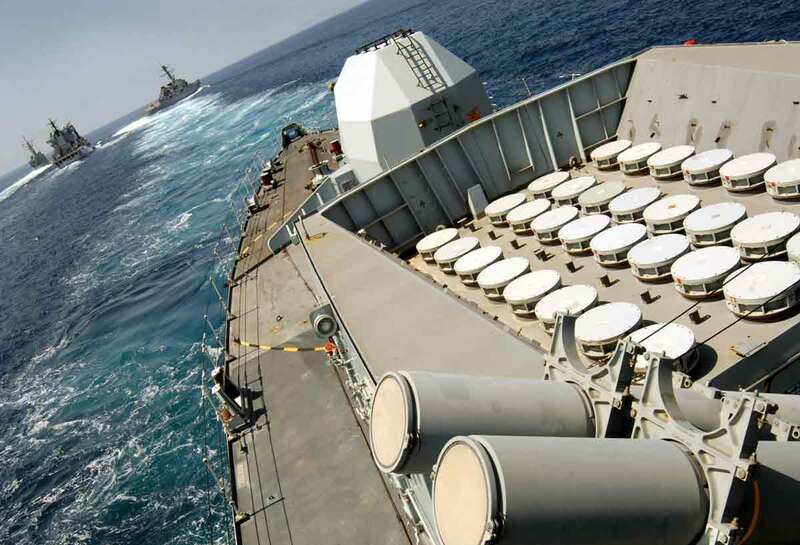 Dstl’s Open Architecture Combat System (OACS) is another enabling technology, making it much easier for new applications – developed by a wide range of providers - to be integrated into ships’ combat systems. OACS underpinned the success of Unmanned Warrior 16, and will be used during Information Warrior to allow artificial intelligence applications such as STARTLE to be deployed. STARTLE uses AI-based reasoning to help operators analyse air movements to identify potential threats in seconds. Other Dstl projects will apply AI and Big Data to enhance the analysis of imagery from Unmanned Aerial Vehicles to assess potential landing sites and routes to support landing forces.